Orbital Sciences' Cygnus capsule was mated to Antares the night of Dec. 10, 2013, ahead of its planned Dec. 18 launch. Commercial U.S. space company Orbital Sciences Corp. is set to send its second unmanned freighter the International Space Station next week. Attached to an Antares rocket, Orbital's Cygnus spacecraft is scheduled to lift off at 9:42 p.m. EST Wednesday, Dec. 18, from the Mid-Atlantic Regional Spaceport at the NASA Wallops Flight Facility in Virginia. Weather permitting, the rocket launch should be visible for many skywatchers along the East Coast, from South Carolina to Massachusetts. Orbital has a $1.9 billion contract with NASA to haul cargo to the astronauts living aboard the space station. Next week's launch will mark the first of the company's eight planned resupply missions, following a successful demonstration flight of Cygnus in September. 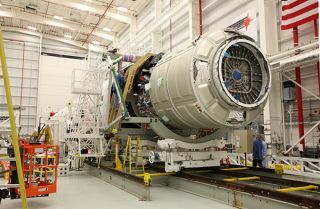 The Cygnus capsule was mated to the Antares rocket overnight, officials with Orbital Sciences said on Wednesday (Dec. 11). After the ship is packed with all 2,780 lbs. of its cargo, the hatch will be closed and it will be rolled out to the launch pad at Wallops on Dec. 16. In addition to astronaut supplies, Cygnus will be carrying 33 cubesates that will later be deployed from the space station, as well as 23 life-science experiments designed by students to study a range of topics, from amoeba reproduction and oil bubble formation to ant behavior in microgravity. This map shows the maximum elevation (degrees above the horizon) that Antares will reach depending on the standpoint of viewers along the East Coast. According to Orbital's visibility maps for its upcoming launch, viewers in cities close to the launch site, in places like Washington, D.C., for example, might be able to see Antares streaking across the sky as high as 12 degrees above the horizon, or just slightly more than a fist's width. From more distant locales, such as New York, the rocket may only appear to be 5 degrees above the horizon. For those without a prime viewing spot, NASA TV will begin its coverage of the launch at 9:15 p.m.
Orbital is one of two commercial U.S. companies with a NASA contract to send unmanned deliveries to the space station. The other, SpaceX, which was founded by entrepreneur Elon Musk, became the first private company to send a vehicle to orbiting outpost with the flight of its Dragon capsule in 2012.